The holidays have arrived. For book lovers everywhere this means TIME – uninterrupted, guilt free time to read and read and read! 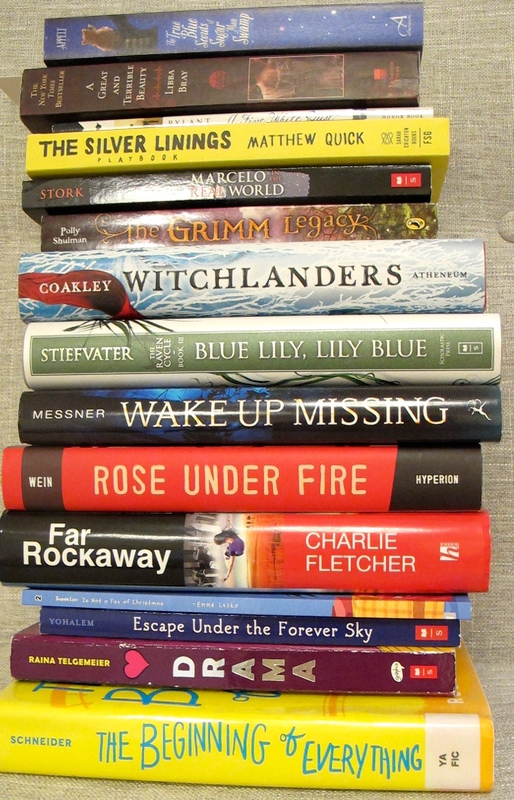 This is my celebration this week – my anticipation of time with books to be lost in and inspired by story. 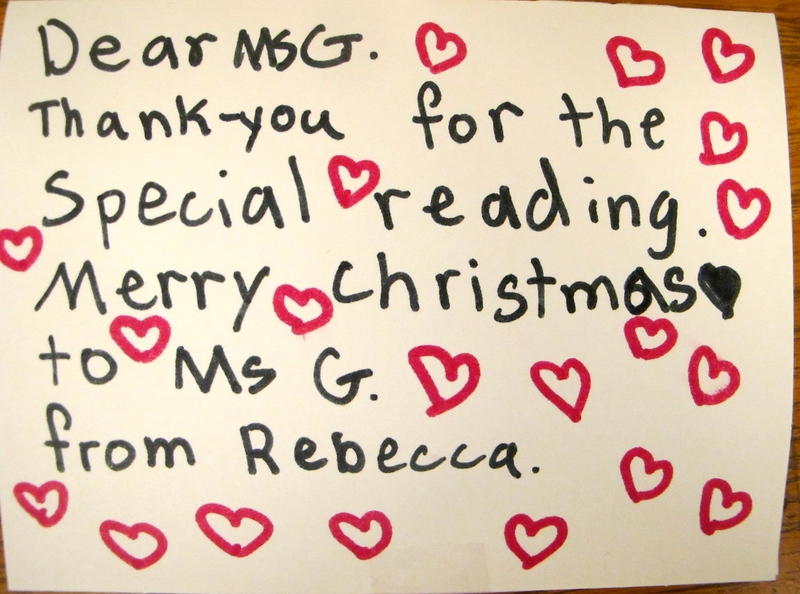 My favourite holiday note was this one from Rebecca in my class. It is so wonderful that our first term was full of so much special reading. Better still that Rebecca chose to highlight it in her note to me. What I love about the holidays is that I get lots of time to feed my own reading cravings – which lets me come back in January, refreshed and ready to create more time for “special reading” with my students. I am a reader. My students are readers. We are a reading community! Currently, I have very ambitious reading goals that I am horribly behind with. I waver between being certain that I will still meet them and considering myself incredibly foolish to even think it is possible. But, I celebrate my ambitious plans to try! I have a goal of reading 100 novels this year. I did it last year. This year the prolonged teacher’s strike ruined my relaxed summer reading and I fell behind. Last night I finished two novels and this morning I read a beautiful novel in verse. A little surge of hope happened! How it stands now: I have finished 82 out of 100 titles to meet this goal. 82 done. 18 to go. 11 days. Hmmm. . .
Wishing all of you some quiet time to read and enjoy a book or two (or eighteen if you have a goal like mine!) Elisabeth Ellington, I know you hear me! Exactly. Not impossible. So . . . here goes! I am amazed that you can do this feat, but if anyone can… Happy Holidays, Carrie. (Read Rose Under Fire-loved it!). I need to read Blue Lily, Lily Blue, too! I will also be amazed but I do have some really delicious coffee in the house – maybe it will keep me fuelled up to read! Wow what an impressive book pile and goal. I am nowhere near you, but am looking forward to the promise and possibilities for reading in the weeks ahead. I just finished Drama (<3) …looking for my next PD book. Happy reading Carrie. And to you! As one of my students once said, I am a “crazy book lady” so I have some crazy goals! Those are some very fat books! I’m trying to balance the fat books with some super skinny ones. Sadly, YA seems to be all about the fat book. I love that you’re celebrating the same thing I’m celebrating today. I am certain we can do it! I may have to substitute some thinner MG novels into this pile. The fat books are on my #MustReadin2014 list so feel like I have to tackle them . . . Appreciate the cheers! Wish I was completely organized for the holidays and then I could just read but . . . sadly, not! Funny how this self imposed goal is so motivating. Brings out the creative problem solving! I may be looking for skinny spines the closer I move to the 31st but there are a few thick titles I am not going to pass over! Happy Holidays and Happy Reading, Carrie! I am trying to read 650 books this year but haven’t hit 600 yet! busy, busy, busy reading! My holiday plans: sleep and read (the food and family part is given). Your TBR pile and reading goal are impressive. Happy reading! Thanks Terje I need to factor in enough sleep too! And I combine reading and family with family reading time 🙂 Everyone on the couch, book in hand, fireplace on, quiet . . .
18 titles??!?! That’s amazing! I was just telling my husband tonight maybe 4 titles…I need to get busy! 😉 (And off my laptop!) Have a lovely break! Oh . . . but I haven’t read them yet! Awesome! Best wishes for achieving your goal, or enjoying the attempt anyway. Enjoy the break. I look forward to meeting up again in 2015. So many books… I always think I have more time to read than I do. I love having too many good books to read! Did you see book #4 in the Lunar Chronicles is coming out next month? I think that series will be on my #mustreadin2015 list! My daughter is very excited about this title!